José Miguel Contreras and Laura Barrett are both staples of the Canadian music scene, the former being the frontman of By Divine Right and the latter being a respected solo artist who has also played with the Hidden Cameras. Soon, the pair will shift their talents into acting by appearing in the Toronto indie film Porch Stories. The film is being directed by Sarah Goodman, who previously tapped Jim Guthrie to score her flick When We Were Boys. Her other credits include Army of One and Hidden Driveway, as well as work on The National Parks Project. For Porch Stories, Goodman is focusing on an engaged woman named Maddie, whose future is thrown into uncertainly by the reemergence of a man from her past. Maddie's actions then have an impact on her neighbours, including an old Portuguese couple and a musical brother/sister duo. Contreras and Barrett will be playing the lead roles. We're assuming that this means that Barrett will play Maddie and Contreras will be the man from her past (although it would also make sense if they're the musical duo). Along with acting in the film, the pair have penned an original song for the film. 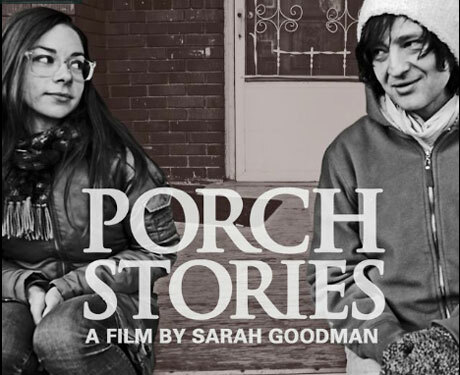 Goodman is currently seeking funding via an Indiegogo campaign, with rewards for donors including a download of the aforementioned song, a DVD copy of Porch Stories, a Toronto-themed T-shirt, and more. Watch a teaser video for the campaign below. Goodman notes that the full cast will include "people who are notable figures from the Toronto arts and culture scene, though not necessarily actors, per say." Judging by comments made in the teaser, it appears that filming has already begun. Laura Barrett Blogs For Exclaim! - From the Yukon!